The IFBB Arnold Sports Festival, also known as the Arnold Schwarzenegger Sports Festival, is an annual multi-sport event consisting of professional bodybuilding (Arnold Classic), strongman (Arnold Strongman Classic), fitness, figure and bikini weekend expo. It was established in 1989 and is named after Arnold Schwarzenegger. The main event is held annually around late February or early March in Columbus, Ohio, United States by the International Federation of BodyBuilding & Fitness (IFBB). It is considered the second most prestigious event in professional men's bodybuilding, physique, figure and bikini; as well as formerly the second most prestigious event in professional female bodybuilding. A lucrative sports competition, the ASF offers a number of large prizes. Most notably, first prize in bodybuilding consists of a $130,000 check, a Hummer vehicle, and an Audemars Piguet watch. Since the Mr. Olympia bodybuilding title pre-dates and offers higher prize money than the ASF, a rivalry in prestige and popularity has sprung up. The ASF is always hotly contested, often with one or two competition points separating the winners..
All-star cheerleading competitions span a two-day period (usually all day Saturday, and to midday Sunday). More than 4,000 competitors entered the cheerleading event in 2014. Each team (of 15-30 cheerleaders) prepares to perform a two and one-half minute routine. After the teams' routines are complete, they are scored by a panel of judges, each judge being an expert on one area of cheerleading (jumps, tumbling, stunting, etc.). Once scoring is complete, every team entered in the competition is called to the mat for awards, during which each team has a chance of winning multiple times. The ASF's awards consist of the following: National Champion jackets, trophies for every team, custom medals, limited edition patches and Grand Champion banners, and possible partial or full paid bid to Cheerleading World contests. In January of 2018, Beth Mandyck, a former nurse and bodybuilder from New York, sued Arnold Sports for discrimination, claiming that the organization discriminated by not fielding a category for women in the annual competition in Columbus, OH. Mandyck’s complaint had the support of 10-time Ms. Olympia Iris Kyle, former Olympic gold medalist Nancy Hogshead-Makar, the advocacy group Champion Women, and the Women’s Sports Foundation. The Arnold stopped offering a women’s bodybuilding competition in 2013 because fewer women were participating, In 2011, the Arnold had 27 women compete in bodybuilding, but that dipped to 18 by 2013. Iris Kyle Heavyweight category not held. Lightweight category not held. Branch Warren Best Poser category not held. Branch Warren Fan's Choice Award category not held. Dexter Jackson Most Muscular category not held. Most Entertaining Routine category not held. Arnold Classic Asia in Hong Kong. ^ Greater Columbus Convention Center. "2013 Arnold Cheerleading & Dance Championships". Arnoldsportsfestival.com. Retrieved 21 January 2013. ^ "Ms. International Dropped from 2014 Arnold Sports Festival". Hard Body News. 7 June 2013. Retrieved 4 December 2013. ^ "She's a 55-year-old nurse and she's a bodybuilding champion". Rochester Democrat and Chronicle. Retrieved 20 November 2018. 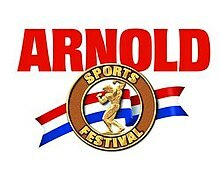 ^ "Bodybuilder files gender discrimination complaint against Arnold Sports Festival". NBC News. Retrieved 20 November 2018. ^ a b Rouan, Rick. "Female bodybuilder says Arnold Sports Festival discriminates". The Columbus Dispatch. Retrieved 20 November 2018. ^ Brown, Steve. "Do You Even Lift? Woman Bodybuilder Accuses Arnold Festival Of Discrimination". Retrieved 20 November 2018. ^ a b c d "Arnold Classic for 2016". The Mercury (South Africa). 20 August 2014. Archived from the original on 8 October 2016. Retrieved 24 August 2016. ^ "Breaking News: Arnold Australia Webcast Comes to Digital Muscle!". digitalmuscle.com. Digital Muscle. Retrieved 24 August 2016. ^ a b "Schwarzenegger sports fests now in Africa, Asia for 6 total". AP Online. 4 March 2016. Archived from the original on 8 October 2016. Retrieved 24 August 2016. ^ "2011 IFBB Arnold Classic Europe". bodybuilding.com. Retrieved 25 August 2016. ^ "2012 IFBB Arnold Classic Europe". bodybuilding.com. Retrieved 25 August 2016. ^ "2013 IFBB Arnold Classic Europe". bodybuilding.com. Retrieved 25 August 2016. ^ "2013 IFBB Arnold Classic Brazil". bodybuilding.com. Retrieved 25 August 2016. ^ "2014 IFBB Arnold Classic Europe". bodybuilding.com. Retrieved 25 August 2016. ^ "2014 IFBB Arnold Classic Brazil". bodybuilding.com. Retrieved 25 August 2016. ^ "2015 Arnold Classic Europe". flexonline.com. Retrieved 25 August 2016. ^ Battaglia, Joe (26 October 2015). "Dexter Jackson Continues 'Year Of The Blade' In Dominant October". flomuscle.com. Retrieved 25 August 2016. ^ "2015 IFBB Arnold Classic Brasil". flexonline.com. Retrieved 25 August 2016. ^ "2015 IFBB Arnold Classic Australia". bodybuilding.com. Retrieved 25 August 2016. ^ "2016 ARNOLD CLASSIC EUROPE RESULTS". Retrieved 25 September 2017. ^ "2016 IFBB Arnold Classic Brazil". Retrieved 1 September 2016. ^ "2016 IFBB Arnold Classic Australia". Retrieved 1 September 2016. ^ "DEXTER JACKSON WINS AT THE ARNOLD CLASSIC SOUTH AFRICA 2016". musculardevelopment.com. 28 May 2016. Retrieved 25 August 2016. ^ "2016 IFBB Arnold Classic Asia". Retrieved 1 September 2016. ^ "Arnold Classic Europe 2017 Results". Retrieved 25 September 2017. ^ "Arnold Classic South America 2019 Results & Event Pictures". Fitness Volt. 14 April 2019. Retrieved 14 April 2019. ^ "Arnold Classic Australia 2019 Results & Prize Money". Fitness Volt. 16 March 2019. Retrieved 14 April 2019.